This guide provides instructions for the simplest install path for Red Hat JBoss Developer Studio. For complete installation procedures, see the Install Red Hat JBoss Developer Studio guide at https://access.redhat.com/documentation/en-US/Red_Hat_JBoss_Developer_Studio/. Click the Download button. You are prompted to save the ZIP file to a directory of your choice. Open a terminal and navigate to the directory containing the downloaded .jar file. Alternatively, you may be able to double-click the .jar file to launch the installation program. Select I accept the terms of this license agreement and click Next. Adjust the installation path and click Next. If the installation path folder does not exist, a prompt will appear. Click Ok to create the folder. Choose a JVM, or leave the default JVM selected, and click Next. Red Hat JBoss Developer Studio includes Red Hat JBoss Enterprise Application Platform. If it was previously installed, choose No. Otherwise, choose Yes to install and configure it for use with Red Hat JBoss Developer Studio. Review the installation details, and click Next. Click Next when the installation process is complete. Configure the desktop shortcuts for Red Hat JBoss Developer Studio, and click Next. To start Red Hat JBoss Developer Studio, you can double-click on the desktop shortcut created during the installation, or you can start it in a command line. This topic describes how to start Red Hat JBoss Developer Studio using the command line. Open a terminal and navigate to the Red Hat JBoss Developer Studio installation directory. These instructions assume this is your first introduction to Red Hat JBoss Developer Studio and you have not yet added any Red Hat JBoss Enterprise Application Platform servers. The procedure below adds the JBoss EAP server using the Define New Server wizard. Select Servers from the Server folder and click OK.
Click on No servers are available. Click this link to create a new server... or, if you prefer, right-click within the blank Server panel and select New → Server. 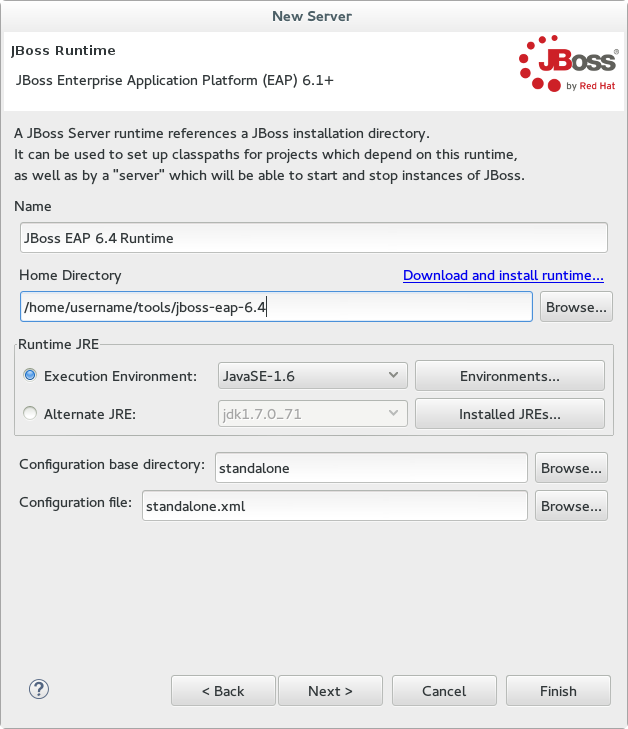 Expand JBoss Enterprise Middleware and choose JBoss Enterprise Application Platform 6.1+. 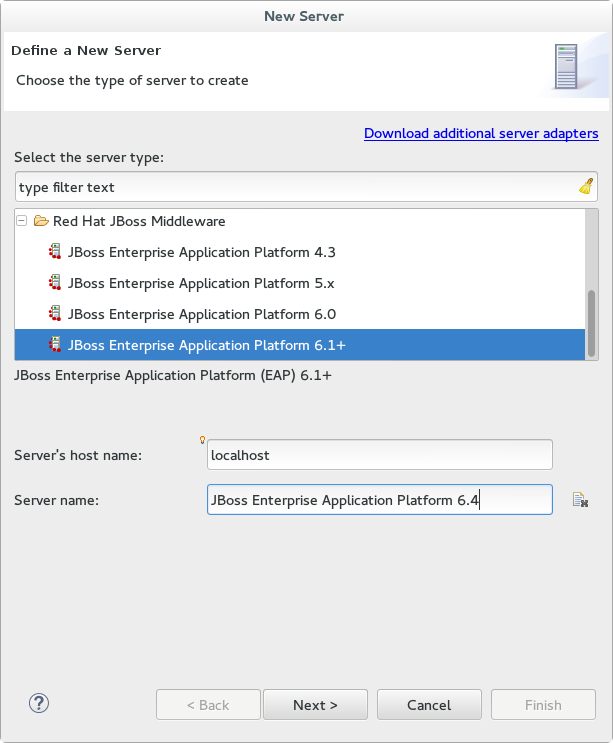 Enter a server name, for example, "JBoss Enterprise Application Platform 6.4", then click Next to create the JBoss runtime and define the server. The next time you define a new server, this dialog displays a Server runtime environment selection with the new runtime definition. 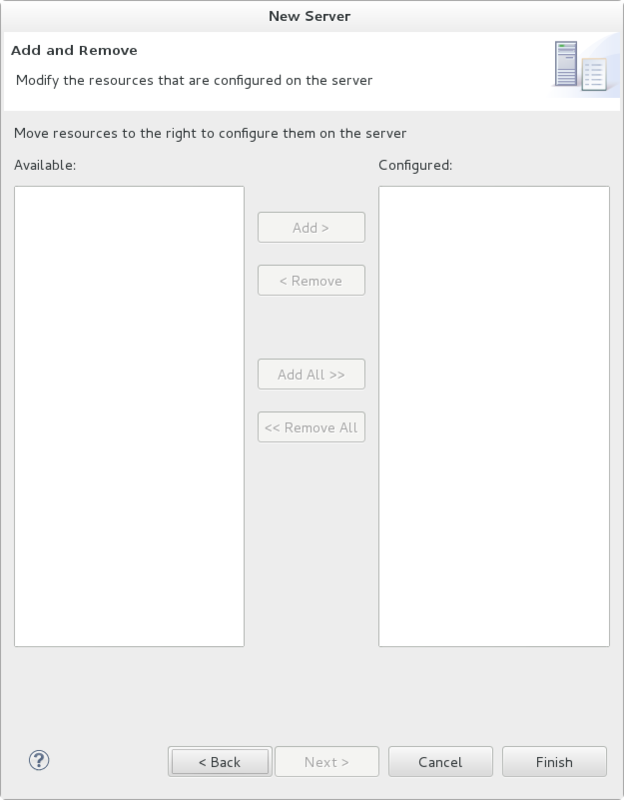 Create a Server Adapter to manage starting and stopping the server. Keep the defaults and click Next. Enter a name, for example "JBoss EAP 6.4 Runtime". 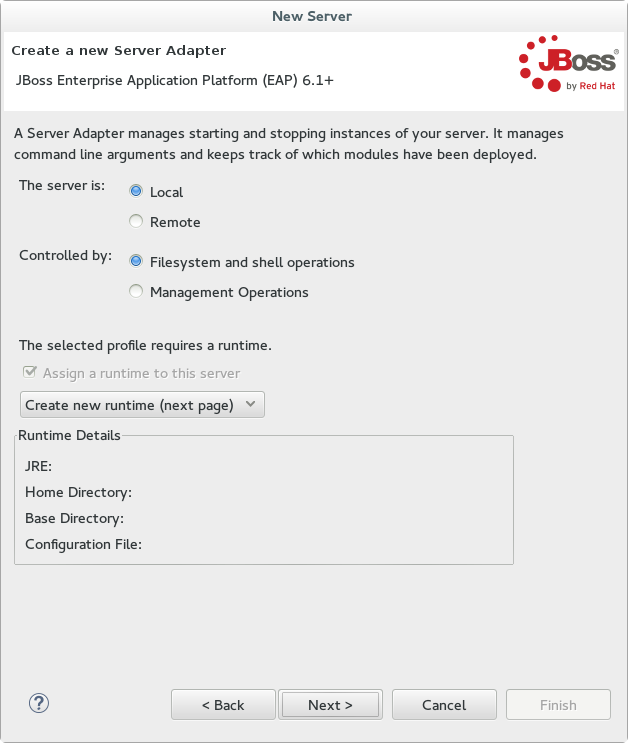 Under Home Directory, click Browse and navigate to your JBoss EAP install location. Then click Next. Some quickstarts require that you run the server with a different profile or additional arguments. To deploy a quickstart that requires the full profile, you must define a new server and add a Server Runtime Environment that specifies standalone-full.xml for the Configuration file. Be sure to give the new server a descriptive name. Configure existing projects for the new server. Because you do not have any projects at this point, click Finish. The JBoss EAP Runtime Server is listed in the Servers tab.